The next operating system for the iPhone—iOS 6—comes with a few new nifty features and updates. You'll see a couple of those new features in Apple's Game Center, the leaderboard hub where you can track your friends' progress in various iOS games. But what's new is that now you can challenge your friends, too. So when I loaded up Game Center, I noticed that our own Stephen Totilo needed to step up his Canabalt game. And I sent him a challenge like this. 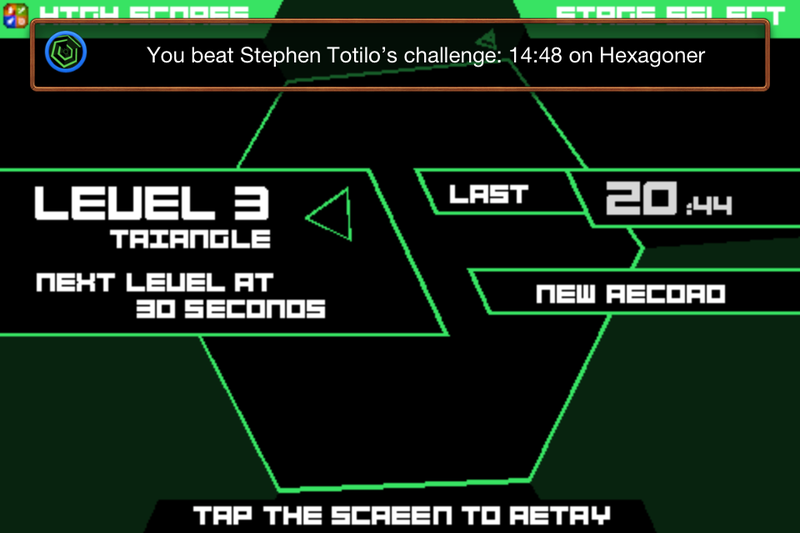 But he had my Super Hexagon score beat in the Hexagoner mode. Actually, I hadn't even played that mode on my iPhone yet, so Stephen couldn't challenge me until I got a score. Any score at all would do, so long as it was below his best time. So he sent me a challenge. Which up close looks like this. Which automatically sends two messages to Stephen. The first is that I've beaten his challenge. The second offers a new challenge, aimed at him. After he beat my new challenge I received a similar notification. (Ignore my cat on my wallpaper). When I load up Game Center to check on these notifications I see this. And when I click on that I get here. And the process repeats itself after that. Challenges in Apple's new Game Center help you keep up to date when a friend beats your latest score, especially in a score-heavy game like Super Hexagon. My friends and I had taken to Twitter to boast our scores and present our verbal challenges, but the new challenge feature does all the legwork for you. Unfortunately nothing is yet synced enough or streamlined to have challenges open up a game at the mode you need to play, or remind you what score you need to beat. In-game Game Center options also vary depending on the game you're playing. While you could browse most of the Game Center in Super Hexagon (granted, catered to that specific game), for instance, Canabalt's options are limited to signing in and out. The two applications—Game Center and whichever game you're playing—still feel limited by a wall between them, but we'll hopefully see developers coding games with the new Game Center features in mind in the very near future.